I didn't put up a tree this Christmas and used my mother's vintage tree along with this one to decorate. It is a pretty tree. The only thing I didn't like is that the light and base are not connected to the tree. Great gift for the value. The recipient loved it - nice twist on the standard green. 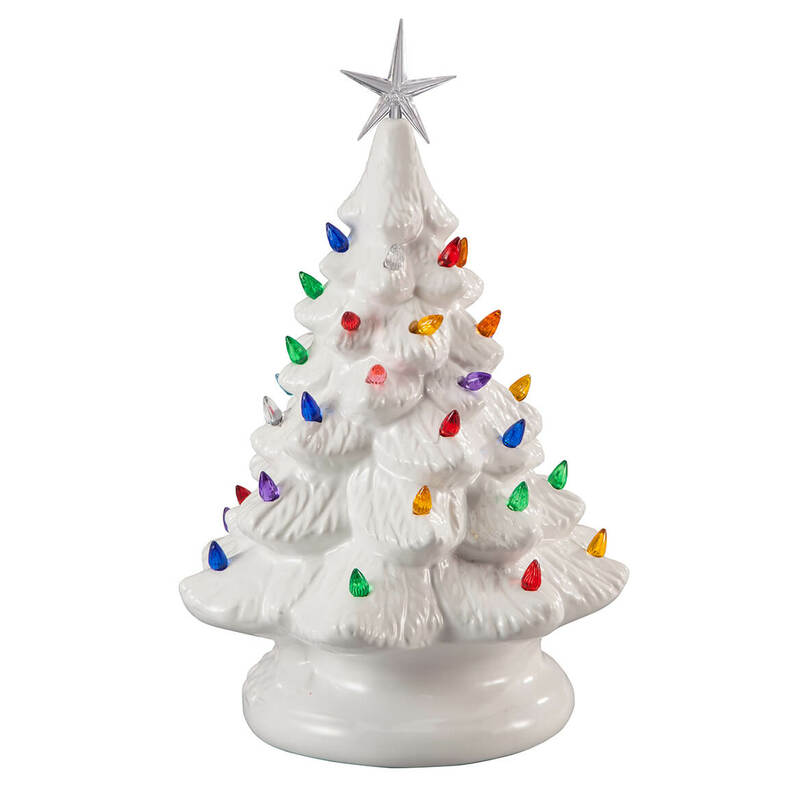 I am very happy with this white CERAMIC Christmas Tree!! 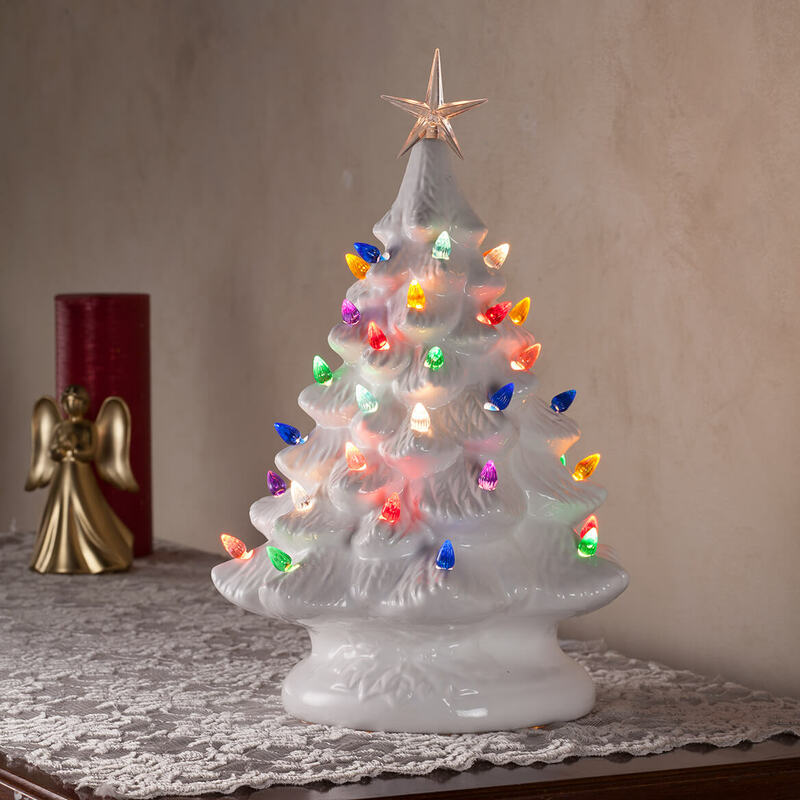 I'm in mid-70's, & growing up, these trees were a fixture in most homes at Christmas, except they were all green, so I was very pleased to find these in white & actually ceramic rather than plastic!!! They bring back warm memories, as well as look very pretty!! And, being on sale, I was able to purchase two for the normal price of one...two thumbs way up?? I purchased two of these one green one white for my daughter's. My Mum used to have these trees all the time, so I started a tradition with them. The trees are well made, the lights are bright would definitely recommend them. Ceramic tree our family tradition! Yes, I would. They're a little expensive, though! To put them on bar. The electric light socket was poor design - loose wires that fell out - looks dangerous, so I replaced it with another fitting. The star was missing, but customer service sent me another one - thanks. Because i think the lights will show up a lot better on a white tree than on the green trees. Ordered the green one and the quality is outstanding. Just beautiful. Decided to get a white one, as well!! Perfect size tree for my small space in the kitchen. My daughter-in-law wanted a tree just like the one we have had for 40 years. Beautiful change of pace from the green. Love the colored lights. BEST ANSWER: Thank you for your question. The tree is 12 1/4" high x 9" dia. We hope this information will be of help to you.